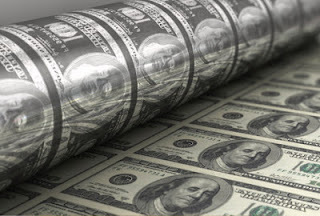 This pair of cliches about money reveals the dilemma we face in using printed money. It's just paper. Really special paper, made of cotton and linen and colored fiber inclusions, but still just paper. Its value comes from us, from our minds and hearts, not from the paper and not from the ink. I suspect that a lot of printmakers and artists who work on paper will recognize this conundrum. The words in black are modeled on my father's handwriting. When I was a child my mom told me never to put my hands in my mouth after touching money. She said money is dirty because so many people have touched it. This is the sixth print in a series examining figures of speech about money that use the same metaphor for both wealth and poverty. The words in black are modeled on my father's handwriting. This is the fifth print in a series examining figures of speech about money that use the same metaphor for both wealth and poverty. The "pile" in this image is based on a photograph of a pile of dried cow dung. The words in black are modeled on my father's handwriting. Four more to go in this little series of works. If you find yourself in the Berkshire Mountains of Massachusetts over the July 4 holiday, stop in at Ferrin Gallery in Pittsfield on July 6 from 6 to 8 pm for the opening of the latest installment of “Zea Mays Printmaking at Ferrin.” Nanny Vonnegut (image on right) and I share a wall with her monotypes and my Loaded series woodblock prints. You can also see the amazing and beautiful COVET show while you're there.